The University of the Philippines Lady Maroons made headlines last week with a hard-earned victory to rule the 2018 Philippine Superliga Collegiate Grand Slam at the Filoil Flying V Arena in San Juan. 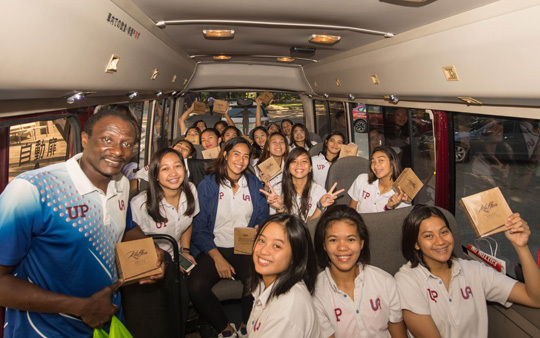 Coach Godfrey Okumu and the UP Lady Maroons are on their way to another practice session. Preparation has been key for the squad which annexed two pre-season championships ahead of the UAAP volleyball tournament. The team beat the UST Golden Tigresses in four hard-fought sets to claim the crown. Head coach Godfrey Okumu said the squad not only prepared hard but prepared smart. They maximized use of their practice time which they had to fit into the busy schedule of their student-athletes. “How did I prepare my players? We believe in the principle of hard work and as we all know hard work always gives positive results. We work hard, but not for many hours. We still have to give our players time to study. We believe more in quality rather than quantity,” he said. UP displayed not only skill but also mental toughness and resilience in pulling out the victory. The Lady Maroons trailed 0-4 and then 2-8 early in the fourth set against UST but managed to rally thanks to Nicole Magsarile’s efforts from the service line. UP is formidable in large part because of its style of play which relies on speed and pace rather than just sheer power. Other teams have found it hard to defend against. “We rely on the Japanese style, which is very fast-paced type of play, with power and accuracy. To say the truth, we as a team have yet to reach there. We are still working on our passing, which really needs polishing. The other thing that we are still working on that can be borrowed from the Japanese, is both the net and floor defense which we are still working on,” said coach Okumu. The team is not a finished product. But they are on their way. In the meantime, players have stepped up for the squad making key plays that resulted in the victory. Arianne Layug’s drop shop brought UP to the championship point. She followed that with a spike down the middle to seal the title for the Lady Maroons. Because of the victory in the prestigious tournament, even with powerhouse squads like Ateneo and La Salle, UP is considered one of the favorites in the coming University Athletic Association of the Philippines season. Okumu confessed this is a welcome though unexpected honor. “Wow, that is something new for me. All the teams in UAAP are good teams that should not be underrated. UP Women’s Volleyball Team is showing great signs of improvement, and like all the UAAP teams, we have a chance to be great. None of our players graduated, so perhaps that is the reason why some people believe that we are the most favorable team,” said Okumu. Whether coach Ukumu likes the pressure or not, UP is considered one of the favorites now. This is UP’s second preseason championship after they captured a Premier Volleyball League title last September. The UP mentor said he considered the squad to be a champion team for several years now. It was just a matter of time before the public found out. “We as the UPWVT expect to perform better than last year and if possible bring the championship home. My other expectation is the team’s growth and also individual growth. We know what is at stake. I still believe that it will not be an easy season because our opponents are also strong and it will be just a game of minds,” said coach Okumu.